The Xyron 510 two sided lamination cartridge allows you to easily permanently laminate both sides of most items up to 4.5" wide. This cartridge can be easily inserted and removed from the Xyron Creative Station 510 Laminator making it simpler than ever to laminate your documents without any heat or electricity needed. This refill cartridge is 18' long and fits into the Xyron 510. It permanently laminates items front and back and is ideal for laminating recipe cards, bookmarks, or game cards. The laminate protects and preserves items giving them durability. Excellent cartridge to refill for my machine. Great price. Thanks again overstock! Welcome to MyBinding video. 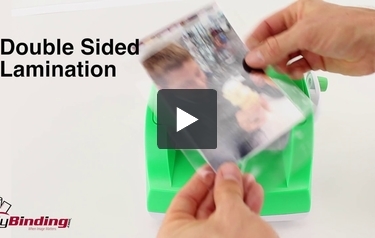 So you’ve got the Xyron 510 and you love it but you’ve run out of your two-sided lamination. Well this is a refill cartridge. Regardless of the color of the cartridge or the box it came in, it will fit. Just make sure that label is facing forward and you’re ready to go. Lift the lid with the white tab on your Xyron 510, pull out the old cartridge if there is one and put in the new one. It’s 5” wide so anything 5” or less will fit in the front and the roll itself goes for 18’. The laminate itself is acid free and non toxic so it’s great for photos and anything that you’d like to preserve. Place it in the front, spin it out the back and use the built in cutter on the back side to remove your project. There you have it. Now with the same machine you can do double-sided lamination. That’s the Xyron 510 Two-Sided Lamination Cartridge. For more demos, reviews and how-to’s, check out MyBinding.com.